LEEKS - The Healthy Choice! Known as ‘The poor man’s asparagus’, leeks have been a British culinary staple for generations. They might have taken a backseat in recent years, but they are now back, undergoing a welcome revival in popularity and oozing with real flavour. in September, peaking again in the spring – so there’s plenty of time to enjoy this flavoursome legume. As well as great tasting, leeks are amazingly good for you too. They have many of the same health benefits as their onion relatives, such as helping to maintain a healthy heart and circulation, protecting against cancer and generally boosting the immune system. Classic duck and orange flavour combination served in an original way. Pierce duck skin and pan fry skin side down for 5- 8 minutes until the fat starts to run out. Oven cook for 15 minutes skin side up. Prepare the puree. Simmer the sweet potato for 15 minutes until just beginning to soften. Add the leeks and cook for a further 5 – 8 minutes until they are both soft. Drain and mash together to give a rough puree. Heat the olive oil in a solid based saucepan and fry the ginger, orange zest, garlic and cloves together for 1 – 2 minutes without browning. Add the orange juice and the mashed leek and sweet potato mixture and stir to combine. Cut duck breasts into thin slices and fan out onto a bed of the leek puree. Drizzle with the duck cooking juices. Garnish with watercress and serve. A warm salad of chunky rounds of leek and pepper. Oven roasted with thyme and oregano in a white balsamic vinegar and olive oil dressing finished off with a liberal sprinkling of pine nuts, leaves of rocket and parmesan shavings. Serve as a light lunch accompanied by some foccacia bread or as a first course. Place prepared vegetables and seasonings in a roasting pan along with the olive oil and balsamic. Cover with wetted baking paper and scrunch over vegetables to seal. Oven roast for 30 minutes until tender and just starting to brown. Combine with the remaining ingredients and serve. 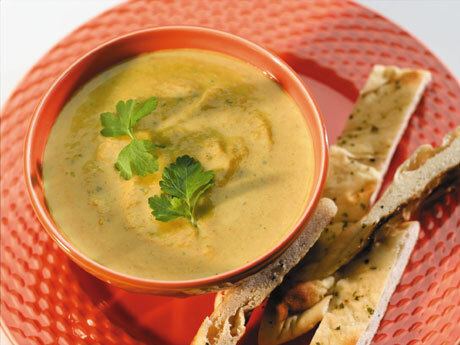 Delicious spiced warming thick soup for supping on chilly days. Great served with fingers of grilled nan bread. Gently sweat the shredded leek in the butter and olive oil for 5 minutes to soften. Stir in the spices and cook for a further 3 minutes. Add the sweet potato, seasoning and stock. Bring to a gentle simmer. Cover and simmer for 30 minutes. Whiz in batches in a food processor with the single cream and coriander until smooth. Top with the coriander leaf and serve with fingers of warm nan bread.